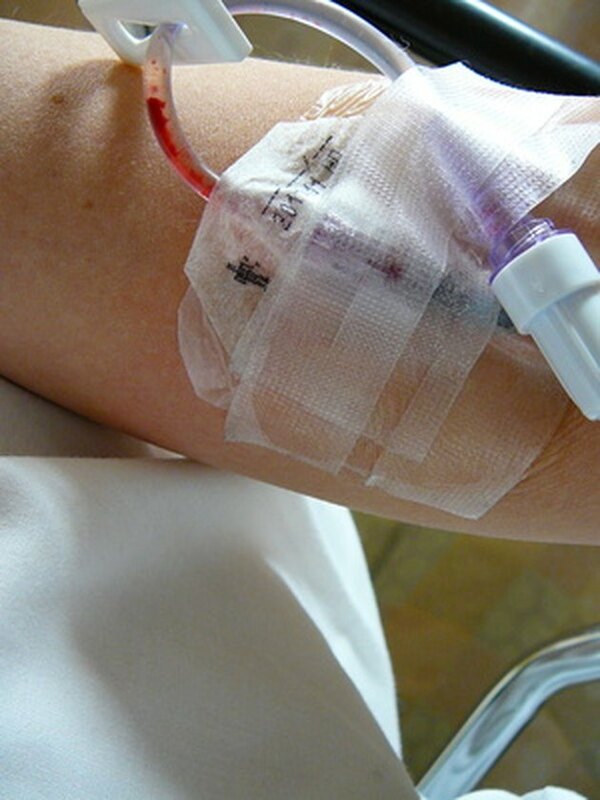 An intravenous catheter, often shortened to IV, is commonly used to gain access to the circulatory system. It is often placed in one of the blood veins of the arm or hand, and once in place, can be used to deliver fluids to a patient or to give medication that cannot be taken by mouth. However, complications associated with IV access do occur. A study published in 2004 in the "Journal of Trauma" included 67 patients who, while hospitalized, developed complications related to having an IV in their arms. Infiltration was found to be a common complication. Infiltration is defined as the fluids within the IV leaking out of the IV, into the blood vessel and then into surrounding tissue. IV infiltration can be a painful complication; the authors of the 2004 study defined this complication as occurring when patients developed significant swelling and pain around the site of the IV. In this study, 26 patients—nearly 40 percent—experienced a temporary infiltration that did not cause any long-term damage. An additional six patients suffered from a major episode of infiltration, defined by the authors as an event that needed antibiotics or resulted in long-term effects. These results suggest that IV infiltration is a frequent possible side effect of having an IV in place; it is often a minor complication but may infrequently develop into a more serious complication with long-term effects. According to the National Institutes of Health website Medline Plus, cellulitis is a bacterial infection that occurs within the deepest levels of the skin. While it often occurs due to a break at the uppermost layer of skin, such as a cut, it may occur as a complication of IV infiltration as well. Symptoms of cellulitis include redness and warmth at the area of infected skin, fever and pain. The skin, which is being infected from within the deepest layer, may take on a shiny look. According to the Mayo Clinic website, the bacteria causing cellulitis, once within the bloodstream, can spread throughout the body. Cellulitis—whether from an infiltrated IV or from other causes—is a potentially dangerous situation. Patients who are noticing symptoms of this infection should consult with their healthcare provider to make sure they receive appropriate treatment. When an intravenous catheter causes infiltration, resulting in fluid invading the tissue around the IV, it is possible that a nerve—for instance, one of the nerves in the arm or hand—could be damaged. In such cases, patients would not just experience the discomfort associated with infiltration, they would also potentially lose some functioning of their hand, or feel strange sensations, such as numbness or tingling. In the 2004 study examining complications of IV placement, the authors found that fortunately, such complications were rare. In their group of patients, only two patients—just 3 percent of the total number of patients in the study—experienced any sort of nerve damage. Patients who are going to need IV access should be aware that this complication of IV infiltration may occur but should be reassured that it is not a common complication.